Mensur was born in Eritrea (East Africa) in a community with a temperate and beautiful climate. Life was stable for Mensur and his family. His mother owned her own business and his father was an administrator of the town (similar to a mayor’s position in Canada). Mensur was a typical child with little to worry about, who enjoyed playing sports and wasn’t particularly interested in school. According to Mensur, “Everything was good, life was good, until my father was wrongfully arrested. Most refugees have a stable life before a sudden change (war, danger) forces them to leave their home.” Once his father was released from jail, his parents realized it was too dangerous to stay. Mensur and his family moved to the country of Sudan. From Sudan, the family eventually made their way to Ethiopia to a refugee camp with a small village-like population of approximately 17,000 people. While in the camp, Mensur enjoyed playing what was to become a passion of his - soccer. He also took language classes and settled into enjoying elementary and then high school. Mensur studied hard and received a ‘4’, the highest grade possible in a ‘National Exam’. During his high school years at the refugee camp, he achieved a 97% average. It is easier for single mothers to be accepted as refugees, so the family made the excruciating decision to separate, hoping to reunite in the future. His mother and siblings made their way to Canada in September, 2014. Upon their arrival, the community of Regina was friendly and welcoming. Mensur stressed that the help they received from Regina Open Door Society was extremely important to them. The assistance from neighbours was also highly valued. 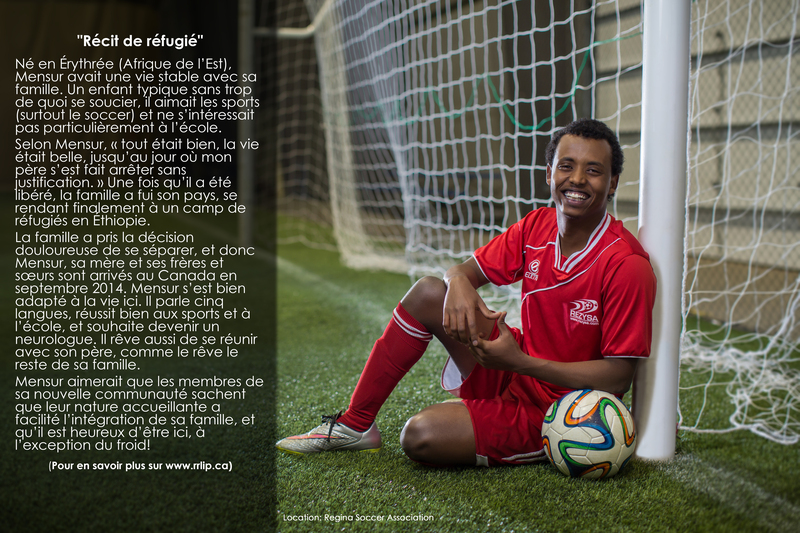 He currently attends school at Balfour Collegiate, plays soccer, and received the ‘Best Player’ award last year. He has achieved excellent marks, with a scholarship in place for his first year at the University of Regina. Although Mensur knows five languages and has adapted well, life has been difficult for his mother. With little language acquisition, the transition from business owner to life in Canada hasn’t been easy. Mensur wants his new community to know that “just because many refugees cannot speak the language, it does not mean they are unintelligent or uneducated.” His mother is a great example of strength and knowledge. Despite the challenges, Mensur and his family are persevering and hoping to bring his father to Canada to join them soon. With dreams of one day becoming a Neurologist, Mensur wants his new community to know that their welcoming nature has made it easier for him and his family and that he is happy to be here, with the exception of the cold weather! Né en Érythrée (Afrique de l’Est), Mensur avait une vie stable avec sa famille. Un enfant typique sans trop de quoi se soucier, il aimait les sports (surtout le soccer) et ne s’intéressait pas particulièrement à l’école. Selon Mensur, « tout était bien, la vie était belle, jusqu’au jour où mon père s’est fait arrêter sans justification. » Une fois qu’il a été libéré, la famille a fui son pays, se rendant finalement à un camp de réfugiés en Éthiopie. La famille a pris la décision douloureuse de se séparer, et donc Mensur, sa mère et ses frères et sœurs sont arrivés au Canada en septembre 2014. Mensur s’est bien adapté à la vie ici. Il parle cinq langues, réussit bien aux sports et à l’école, et souhaite devenir un neurologue. Il rêve aussi de se réunir avec son père, comme le rêve le reste de sa famille. Mensur aimerait que les membres de sa nouvelle communauté sachent que leur nature accueillante a facilité l’intégration de sa famille, et qu’il est heureux d’être ici, à l’exception du froid!